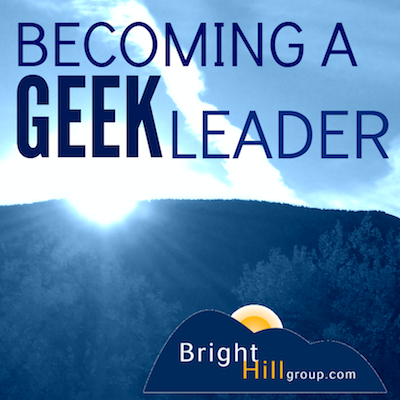 Why "Becoming a Geek Leader?" Most of us geeks tend to be really great at the technical stuff, but not so great at the "people" stuff. As a result, we struggle to communicate clearly, delegate effectively, manage conflict productively and plan well. After years of frustration and struggle, I discovered that these critical skills are not magic - they are LEARNABLE, and when I learned them, my team got healthier. My projects got done faster and better. My customers were happier, and my boss gave me more team members and more work. When I moved from being the smartest technical person to being the leader of smart technical people, I struggled. I never learned these skills! In school I studied memory management, compilers, abstract math and data communications theory. I didn't learn about dealing with people. As a geek, I'm on a mission to figure out better ways to lead others at work and at home. This podcast is all about lessons I learned, lessons I'm learning, and experiences that my clients are wrestling with in the real world. My name is Tom Cooper and I spent more than 20 years working as a hands on technologist and leader in companies from startups to Fortune 500. I'm a geek who personally wrote code, installed equipment, managed development teams and oversaw new product design and launch leading to millions of dollars in sales. Today I am an executive coach, public speaker and trainer who works with leaders and teams of highly technical experts to help them do a better job leading others. Get notified when a new podcast is released!